A colourful and tasty form of Chard with rich ruby-red leaf stalks and dark greeny purple foliage. 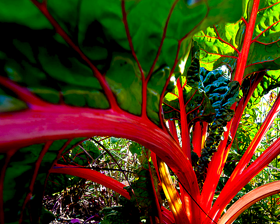 Chard Crimson Red produces an abundance of large, tasty leaves and wide mid-ribs. Cook the succulent mid-rib like asparagus and serve with melted butter. Easier, and some consider tastier, than spinach. If the plants of Chard are left to flower, the flower stalks can be cooked and eaten like sprouting broccoli. Cropping from mid-summer to late autumn. After a normal winter, it will re-emerge to give an unbelievably early spring crop. Sow seeds in October-November or March-April for a summer/autumn crop, mid to late summer for an autumn/spring crop.